The loin of cod is the middle third of a cod fillet, and is especially moist and flaky. 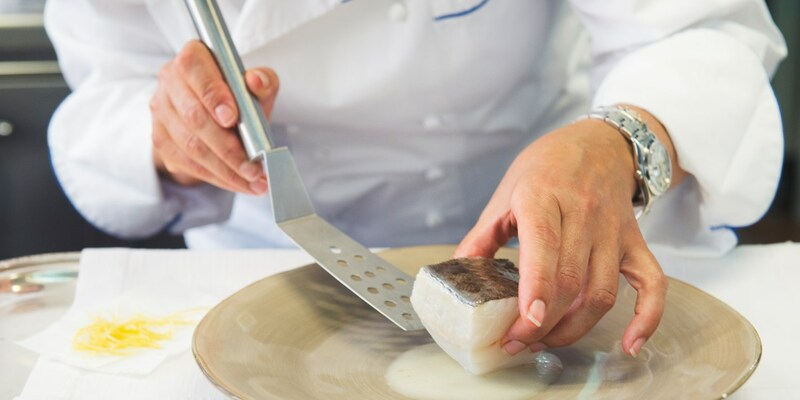 As with the rest of the fish, cod loin has a sweet, subtle flavour and pearly white flesh and is just at home in a full flavoured sauce as it is coated in batter. This collection of cod recipes contains plenty of inspiration for making the most of your cod loin fillet. Mark Jordan's dish of Cod loin and potatoes in a chive butter sauce is enhanced with the addition of a soft poached egg, while Andy Waters’ easy Baked cod in tomato sauce is a fantastic healthy fish recipe. Cod loin works well in tandem with other types of seafood. Frances Atkins' Potage of mussels, salt cod and crab croutes dish is a wonderful seafood medley, while Marcello Tully’s Taste of the sea dish offers a rich take on the classic bouillabaisse recipe. Pair your fish with pork, too - the flavour of cod loin is enhanced by the saltiness that the meat brings to the dish, as seen in Adam Bennett’s Cod loin with chorizo recipe and Graham Campbell’s stunning Pan-roasted cod recipe, served with Jersey Royals and pancetta.